HopeAfterDivorce.org and FamilyShare.com expert Monique Honaman talks about moving forward and taking the high road after divorce on the Today Show with Kathie Lee and Hoda. Monique Honaman had been married for seventeen years when her husband dropped the proverbial bomb with a simple phrase: “How do you think we’re doing?” Two months later, she became a self-proclaimed cliché—forty years old, two kids, and still wondering what happened. 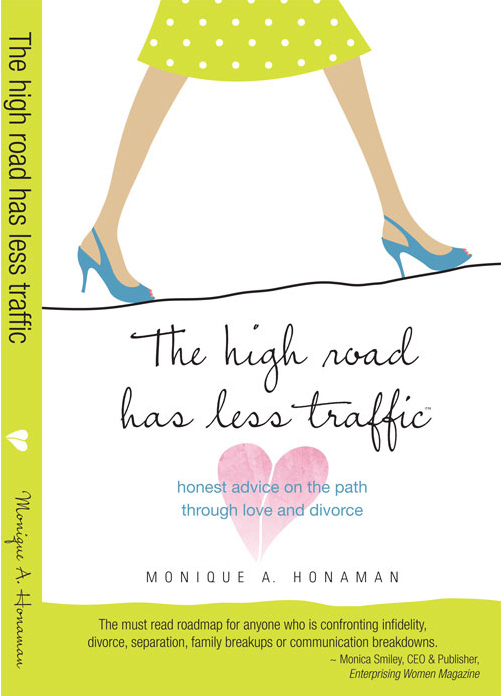 The High Road Has Less Traffic--half memoir, half self-help title—is an inspiring roadmap for marriage, a positive exit strategy for "surviving" divorce, and a powerful life philosophy that supports superior decision-making in all facets of raising a family. With current divorce rates remaining high, this philosophy could not come at a better time. It is estimated that 20% of first marriages end in separation or divorce within five years. 33% of marriages don’t make it to ten years. And by fifteen years, a full 43% of couples have called it quits. Readers and experts are giving The High Road rave reviews. Dr. Marcia H. Rogers calls it “an excellent resource for parents experiencing divorce,” and Dr. Bill Lampton, author of The Complete Communicator, hails it as a “must-read.” Dr. D. B. Shelnutt, Jr. states, “This is a phenomenal read that will help bring healing for those wounded from divorce. I could not put it down.” In the spirit of giving back, a portion of proceeds from book sales is being donated to organizations that help women and children transition through divorce. Monique A. Honaman is an expert contributor at HopeAfterDivorce.org and FamilyShare.com. She has been featured in HR Executive, the New York Times, NY Post, Corp Magazine, and several regional business publications. Monique received her Juris Doctorate from Albany Law School and was profiled by the Atlanta Business Chronicle as one of the "40-Under-40-Up-and-Comers." She was named one of the "2007 Enterprising Women of the Year" by Enterprising Women and one of the "2011 Women Business Enterprise National Enterprise (WBE) Stars" by the Women's Business Enterprise National Council (WBENC). Monique received the POW! Award (2012) by Womenetics and is a regular contributor for The Huffington Post. Monique lives in Atlanta, Georgia, with her husband, Justin, and her two children. In her free time, she enjoys being outside, traveling, boating, watching college football, reading books, and taking photographs. For more information, go to her website at http://www.HighRoadLessTraffic.com, hopeafterdivorce.org or familyshare.com and follow her @highroadthebook. Click here to buy The High Road Has Less Traffic. HopeAfterDivorce.org is an online community dedicated to providing individuals and families with resources to help them successfully manage the divorce process. FamilyShare.com is a crowd-sourced online library of articles to strengthen families.